The pomegranate seeds also known as arils, which are encapsulated in white pith. The pomegranate fruit is low in calories, high in fiber, high in vitamins such as C and K and high in phytochemicals that may promote heart health and help to prevent cancer. As with many fruits, pomegranate seeds are low in calories and rich in fiber. Pomegranate seeds and other fiber-rich foods, such as whole grains, may reduce your risk of developing chronic disease and aid in weight management. Pomegranate is a very healthy fruit and it is generally used in fruit juices, salads, raitas..etc in cooking.The seeds are sour in taste so combining with other tasty fruit juices makes it more tasty and healthy. Today i am going to share such a really tasty drink to beat this summer !!! Remove the seeds and add them on a blender jar and blitz the seeds twice or thrice till the juice separate from the seeds. Add half a cup of chilled water and blitz again. Pass the mixer through a strainer and extract the juice by press using a spoon on the mixture. Transfer the contents on a glass and add the orange juice. Add the sugar syrup as needed according to your taste. Dilute if needed with chilled water. Take a glass and on the rim run a slice of orange. Spread some sugar in a plate and move the rim of the glass around to stick the sugar. 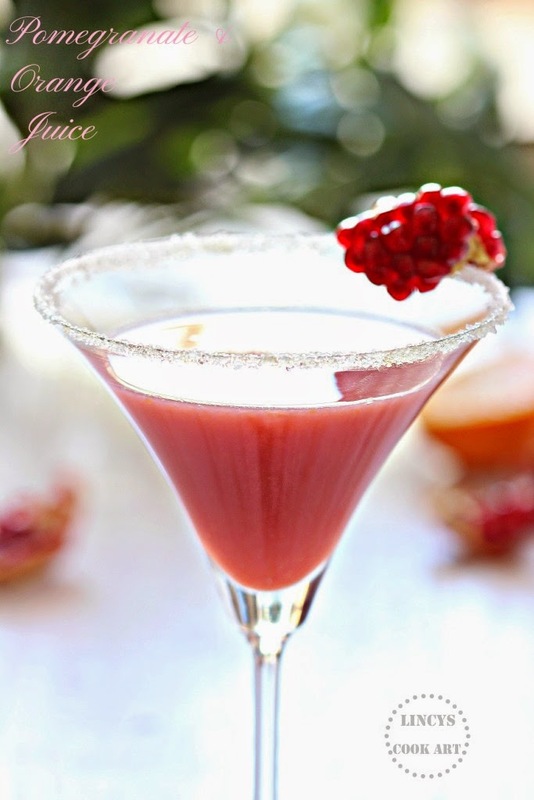 Pour the chilled juice and serve with a pomegranate or orange slice garnish on top. absolutely loved this juice..your clicks are awesome as usual..